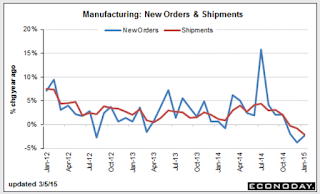 Extending the longest streak since the 2008-2009 recession, Factory Orders Unexpectedly Decline 6th Month. New orders for U.S. factory goods unexpectedly fell in January, posting their sixth straight monthly decline, a sign of weakness in the manufacturing sector. The Commerce Department said on Thursday new orders for manufactured goods slipped 0.2 percent after a revised 3.5 percent decline in December. Economists polled by Reuters had expected factory orders to gain 0.2 percent in January after a previously reported 3.4 percent tumble in December. The Bloomberg Consensus Estimate was also +0.2%, but the forecast range was a very wide -2.5% to 3.0%. 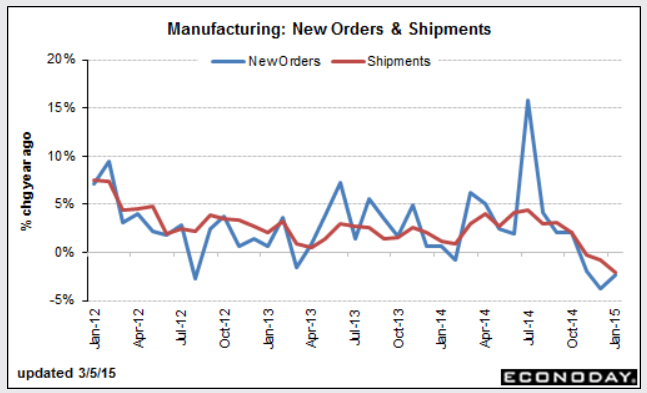 To help explain the chart, Bloomberg notes that "Aircraft orders have a long lead to shipment." Durable goods rose 2.8% due to jump in commercial aircraft orders. It was not enough to offset everything else. In the reports from Reuters and Bloomberg, some blame the rising dollar, some blame weakness in foreign demand, some blame the port strike, and some blame lower oil prices, and some blame cutbacks in the energy sector. No one cited the "slowing global economy".